Federal Polytechnic, Offa [Offa Poly] In Affiliation with Federal University of Technology, Minna [FUTMINNA] B.Tech Degree UTME and Direct Entry Admission Form, Admission Cut-Off Marks, Guidelines and Registration Procedures for 2018/2019 Academic Session. The Federal Polytechnic, Offa Directorate of Degree Programmes and Industrial Collaboration hereby announces the sales of admission form into the B.TECH Degree programmes for 2018/2019 academic session. Applications are hereby invited from interested and suitably qualified candidates for admission into the following B Tech. 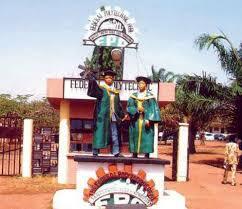 degree programmes of Federal University of Technology Minna in affiliation with Federal Polytechnic. Offa for 2018/2019 academic session. Minimum of five (5) credit pass in English Language. Mathematics, Physics, Chemistry and Biology. In-addition to the UTME qualification in A. Candidates must possess a minimum of LOWER CREDIT at National Diploma (ND), National Innovation Diploma (ND)) or MERIT at NCE level. The candidates with IJMB must score a minimum of five (5) points or four (4) points (CPES, FUT, Minna) and pass at least two (2) subjects relevant to their proposed courses. 1. In addition to UTME qualification in A. Candidates must have LOWER CREDIT at Higher National Diploma (HND) level in their proposed courses. 2. Candidates that have chosen courses not relevant to their area of specialization at ND, HND or NCE level would be required to change to any other course relevant to their discipline during, the screening. 3. Only O,1evel result print-out downloaded directly from the websites of the National Examination Bodies (WAEC/NECO,NABTEB) or photocopies of original Certificates will he accepted for verification. 1. All applicants for screening are to visit http://portal.fpo.edu.ng make payment of N2,000 with an ATM card that is inter-switch compatible.